Cantata BWV 140, Wachet auf, ruft uns die Stimme! recorded in Vienna, 13, 19, and 21 May, 1959. Here comes this recording again !! I find it difficult to see who will buy this disc, particularly given the relatively short playing time. Added to this, there is our current apparent bedazzlement with period performances, and with the market being flooded with brand new, thoroughly researched period performances of the whole series of Bach Cantatas, performed by currently fashionable performers. Vanguard has certainly set itself a daunting target. However all is not lost, as these performances have been in and out of the catalogue over the years precisely because they are good performances, and although are performed on modern instruments, they are very satisfying to listen to. Felix Prohaska has never reached the ultimate accoladed position of being what can be called a famous conductor, but over the years he has produced a number of very fine recordings. These are mainly of baroque and classical works which can hold their own in other, more famous company. The two cantatas recorded here are well performed and recorded, with very enjoyable performances by the three soloists. Added to this, the company of the Vienna Philharmonic (playing under its contractually less emotive title) and Vienna Opera Chorus, there are no shortcomings in the artists. The two works here recorded are among J.S. 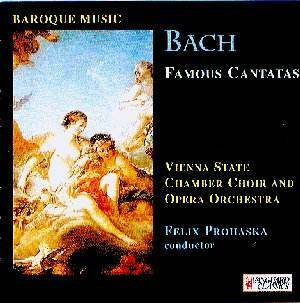 Bach's most popular cantatas, No 140 being the work which inspired the equally famous arrangement as a Chorale Prelude. This cantata, composed for the 27th Sunday after Trinity has as its starting point the gospel reading of the day of the parable of the 10 wise and foolish virgins. Bach selected Philipp Nicolai's hymn "Wachet Auf" which touches on this subject as the basis of the work, forming the first, third and last movements. These are interspersed with recitatives and duets. Cantata No. 4 was composed for Easter Day 1724, although scholars date it earlier than this. The work describes Christ's trials and suffering and of His ultimate redemption. The cantata is based upon the Lutheran hymn "Christ lag in Todesbanden" which itself was based on an 11th century sequence, "Victimae paschale." Provided you can put up with the short playing time, and you enjoy non period performances, you will derive much pleasure from this inexpensive disc.